Thirteen years after the Athanas family shuttered the landmark Anthony’s Hawthorne restaurant downtown, something is brewing. The family isn’t talking, but New Hampshire Demolition was spotted last week at the once-popular eatery evaluating the cost of razing the 16,000-square-foot building on Central Avenue, a source told The Item. The Athanas family also owns the 32,000-square-foot parking lot behind the restaurant on Washington Street. Wig Zamore, a consultant to Anthony’s Hawthorne Inc., said the family is considering its options. He declined to elaborate. Several years ago, the family floated the idea of using the restaurant and parking lot for a mixed-use development that could include housing, retail and office. The Hawthorne parking lot behind the restaurant. “We’d love to work with the city and other people in the area to move that part of downtown forward,” said Zamore. New Hampshire Demolition, the company that razed the landmark Hilltop Restaurant on Route 1, did not return a call seeking comment. 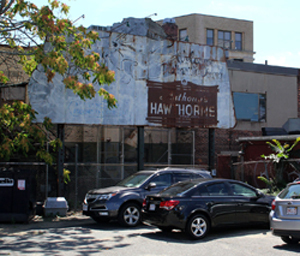 One of the challenges to development is that the land beneath the Hawthorne and the adjacent parking lot is contaminated with chemicals from Whyte’s Laundromat that once operated on Willow Street next to the post office. In 2011, the city’s Economic Development and Industrial Corp. of Lynn (EDIC), a nonprofit that functions as the city’s development bank, considered taking the Athanas property by eminent domain. But no action was taken by the City Council because of the liability associated with the clean up. “The Athanas family’s position has been they will not develop that site until the Whyte’s Laundromat is cleaned up because the contamination from laundry is still coming onto their property,” said James Cowdell, EDIC’s executive director. It appears the clean up, which has a projected cost of more than $350,000, may not happen anytime soon. The federal Environmental Protection Agency recently said no to the city’s request for $150,000 to assess the cleanup of the parcel. The late Anthony Athanas opened what would be the first of five Anthony’s Hawthorne restaurants in 1937 in downtown Lynn. At one time, it was considered the highest grossing eatery in the region. The eatery closed in 2003 and has been vacant since.